I wanted to write something deep and insightful yesterday for International Workers’ Day. I failed. But please accept this worn retread, this burnt offering, recycled from Labor Day, as my meager substitute, presented humbly, as all I have to give. It started in 1913, but not really. For decades, American miners had been used, abused, and treated as subhuman by the businesses that employed them. They were forced to live in company towns, and paid in company scrip that was only redeemable in company stores. These stores always charged just a little more for the essentials than workers were paid, leaving no option but to borrow against future “earnings” in order to maintain a roof over their heads and food on their tables (hence Tennessee Ernie Ford’s famous line, “I owe my soul to the company store“). It was a form of wage slavery that had been practiced since at least the end of the Civil War. Except now it was more than sharecroppers being enslaved, it was everyone. Should a worker be injured on the job, lose a limb, or for any number of reasons become disabled and unable to meet the mine’s production quotas, whether it was his fault or not, he (and his family if he had one) would be cast from the company town with nothing, his usefulness to the company now expired. Tens of thousands starved. Many died. Of course, their demands (reasonable as they were) were rejected by the company. The workers went on strike. Because of the strike, of course, the miners were immediately evicted from the company housing in which they had previously been forced to live. They moved into tents, strategically located along the ingress routes to the mines. There, they would picket and harass the scab workers hired by the company. Often, physical altercations occurred. So, the company brought in strike breakers. These strike breakers would assault the striking miners whenever they were alone. They set up snipers to take random shots at the camps, into the tents, sometimes wounding or even killing those inside. They patrolled with a machine-gun equipped armored car, called the “Death Special” by the miners, and in every possible way attempted to intimidate the workers to give up their strike. This did not achieve the desired result. Violence escalated. The miners dug foxholes underneath their tents for protection against sniper attacks. They held strong in solidarity. Colorado’s national guard was brought in at the behest of the Rockefellers, to try and break the strike, and the union still held together. In March of 1914, a dead replacement worker was found outside the town of Forbes, near Ludlow. He might have been killed by striking miners. He might have been sacrificed by the company guards to justify more aggressive strike breaking and violence. He might even have been just mugged and left for dead, the crime being unrelated to the strike in any way. We may never know. But what we do know is this. On the morning of April 20th, 1924, the company attacked. National Guard units (as well as company guards in National Guard uniforms) opened fire on the camp with Gatling guns from the hills above. The tents, secretly soaked in kerosene the night before by company agents, ignited in a firestorm. The miners fought back, and the firefight lasted all day. By late afternoon, the company brought in reinforcements, hired guns, to swing the battle in their favor. Later in the evening, a passing train stopped on the tracks in front of the National Guard’s machine gun nests, providing cover for the escape of the miners, and their families, before the company’s mercenaries came into the camp, looting and razing it to the ground. But not all escaped the carnage. In the aftermath, it was discovered that four women and eleven children had attempted to take cover in one of the foxholes when the shooting started that morning. The ensuing fires had trapped them inside, where they suffocated and died, clutching one another, staying together to the very end. Their charred bodies a grim reminder of the brutality faced in their struggle, and of the determination of their brothers and sisters, fighting for the rights and dignity they had so long been denied. 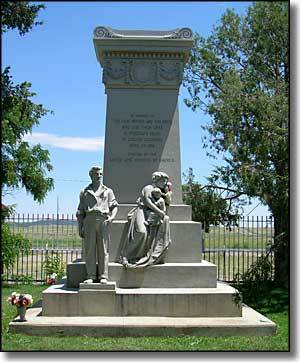 The Colorado Coalfield War was the deadliest strike in the history of the United States. But it wasn’t the only one. Strikes around the country, and the labor battles fought over the decades, took the lives of thousands of dedicated men and women (and all too often, children as well). They died for the sake of their posterity, for their dignity, for their freedom. Their sacrifice is as worthy of our reverence and respect as any in the history of this land r any other. So today, on this Labor Day, have a barbeque. Drink an ice cold beer. Spend time with family and friends, enjoying a three day weekend. Talk and laugh and play games. But also, just for a moment, take the time to listen to the words of legendary folk singer and labor’s poet laureate Woody Guthrie, and remember the people who gave everything so that you could have days like this to enjoy. And remember the names of Ludow’s dead.